patreig wrote: The length of the first episode is exactly the same on the german BR from Studio Canal (01:59:35:320 as indicated on caps-a-holic.com) and the UK BR from Second Sight (01:59:35:320 as indicated on the Beaver review). It must be 25fps in both cases. I see. I was going off of the Beaver review, plus the DVDCompare listing, though sometimes both get technical details wrong, and if the run times are exact, then surely the Second Sight is also 1080/50i, which is excellent, and bodes well for having Berlin Alexanderplatz in the correct speed, too. The DVDCompare listing now says 1080i/50, and David Mackenzie has said over on the Blu-Ray.com forums that Berlin Alexanderplatz will definitely be 1080i too. I'm confused on Heimat. If they're using a widescreen master for the full frame TV program due to its theatrical exhibitions, why then also use 1080i/50? domino harvey wrote: I'm confused on Heimat. If they're using a widescreen master for the full frame TV program due to its theatrical exhibitions, why then also use 1080i/50? I suspect because it was shot at 25fps and there wasn't an alternative 24fps sound mix - it was simply just projected at 24 fps in cinemas. That would have added about 37 minutes to the running time. Most people (including me) didn't notice PAL speed-up when watching films on my television set, so most would not notice cinema/NTSC-slowdown either. The BBFC cinema listing for Heimat from 1984 is something of a mystery as the running time matches the DVD certifications (the Tartan DVD, which I have, is definitely 25fps) and the footage count matches that running time if it were shown at 24fps. 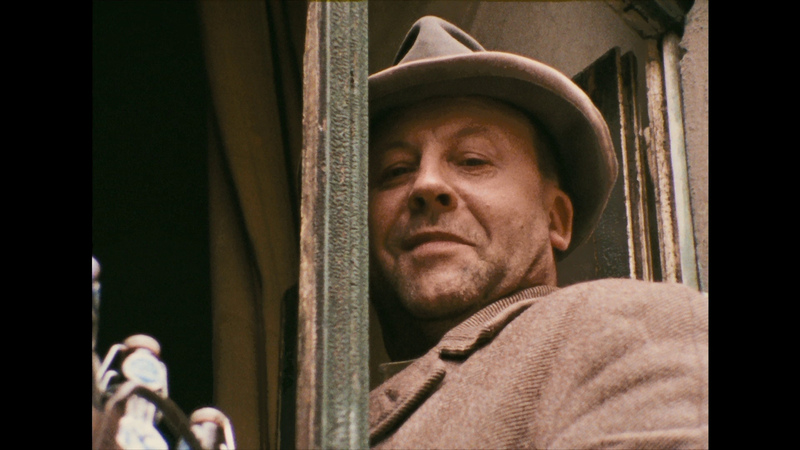 I didn't see Heimat in the cinema, but I wonder if the Glasisch recaps were intact in that version? Removing them would have shaved 35-40 minutes and the running times would then match. That said, some London cinemas could show films at 25fps. I don't know if the Lumiere (where Heimat was shown) was one, but the Curzon Mayfair was - it was used for test-screening television material and commercials in the mornings and sometimes they didn't switch the projector back to 24fps before the public afternoon showings began. That happened at a couple of showings I went to, and I only found out because I'd stopwatched the film. As for the Second Sight Blu-ray, I have checkdiscs here as I'll be reviewing it for The Digital Fix. It is 25fps and 1080i50. Apprently the subtitles are forced on Heimat too right? What a shame. Same logic as Dekalog 5 and 6. Hard matted widescreen because of planned theatrical distribution, but still shot and mixed at 25fps. Review of The Colour of Pomegranates by Lee Broughton on Cinesavant. TMDaines wrote: Apprently the subtitles are forced on Heimat too right? What a shame. You could always get the German Blu-ray. It’s also cheaper. Looks like Colour of Pomegranates has already sold out from Amazon UK. Yeah, I ended up buying it from Diabolik. The latest episode of The Projection Booth examines The Colour of Pomegranates, featuring interviews with Daniel Bird & James Steffen (it’s not yet listed at the above link). Adam Grikepelis wrote: The latest episode of The Projection Booth examines The Colour of Pomegranates, featuring interviews with Daniel Bird & James Steffen (it’s not yet listed at the above link). Thanks! Here is the direct link to the podcast. swo17 wrote: Looks like Colour of Pomegranates has already sold out from Amazon UK. I bought it from Take Time Out the other day for £15.99 after I noticed it keeps disappearing on Amazon. Came well packaged in a cardboard mailer with a cardboard insert further protecting it. Back in stock at Amazon.uk (In stock on May 8, 2018). Aside from the characteristic heavy 16mm grain being much more visible (as you’d expect it to be), does it really look that different? I thought the blu-ray captures looked kind of dreadful, but perhaps it's just the jpeg compression. I'm curious to see other (uncompressed) snaps to see if they turn out differently. David M did the encode, I place much more faith in that than in dvdbeaver caps. Hand on heart, I'm not seeing this "verging on solarisation". The image is certainly fractionally brighter, but I can't see anything untoward about it. Well, maybe solarisation isn’t exactly the right word?, but there’s definitely something off with the compression of those screen caps in regard to the grain; to my eyes anyway. I dunno, I’m not trying to convince anyone they’re wrong though I’m surprised; maybe my internet provider’s recently started doing something weird. What I’m seeing looks nothing like anything I’ve seen that’s passed through David Mackenzie’s workstation. Adam are you talking about the shot of the guy with the hat? Can't enlarge that one, because it links to the previous picture, but that does look off to me too. However, it is DVD Beaver, so it is a good chance that it is just a bad screencap.